8 year/s ago 2109 Visit WebsiteAIBroken link? 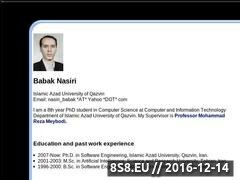 Babak Nasiri is a PHD student in qazvin azad university. He teaches web programming and data structure in Qazvin. He is faculty of Qazvin Azad University. Sorry, BrowseInter.net Website Directory does not contain yet any other websites related to Babak, Nasiri or Meybodi!